Looking for a small tablet and a laptop? The Chuwi SurBook Mini 2-in-1 tablet combines both into a 10.1-inch package. While the SurBook’s build quality and specifications are very good for $250, is it worth your money? 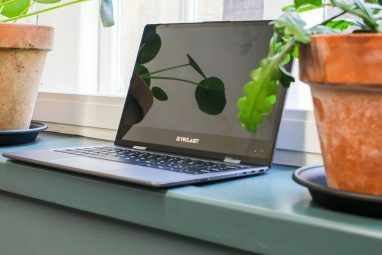 Read on to find out what we thought of the Chuwi Surbook Mini! Chuwi has a reputation as a fairly reliable manufacturer of low-cost 2-in-1 tablets, laptops, and other niche electronics. Their product line includes the Hi Box Hero Chuwi HiBox Hero Windows/Android Mini PC Review Chuwi HiBox Hero Windows/Android Mini PC Review Chuwi is throwing its name into the mini PC space with its HiBox Hero. It's quite reasonably priced, coming with a $130 price tag from GearBest. Read More mini-PC, HiBook Chuwi HiBook Review Chuwi HiBook Review The HiBook comes with both Android 5.1 Lollipop and Windows 10, and you can buy an optional keyboard for getting real work done in either operating system. Read More tablet, Lapbook Chuwi Lapbook 14.1 Review Chuwi Lapbook 14.1 Review Need something cheap but portable, that runs real applications? Chuwi has the device for you: a 14.1" laptop running Windows 10 on the latest Apollo Lake chipset, for the absolutely reasonable price of under $300. 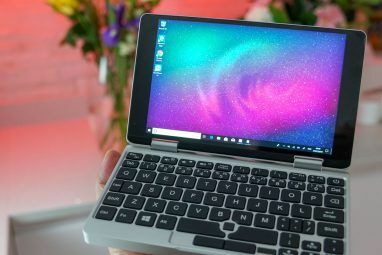 Read More laptop, Hi13 2-in-1 Chuwi Hi13 Tablet Review Chuwi Hi13 Tablet Review Chuwi is taking aim at Microsoft with their latest tablet hybrid. Despite a 13.5 inch, 3K resolution multi-touch display and detachable keyboard, the Chuwi Hi13 is just $420 bundled with the keyboard and active stylus. Read More , and others. They’re not as established a brand as, say, Asus or Dell, but their products are generally good quality. Overall, Chuwi’s brand receives a rough average of 3.5 stars on Amazon. At MakeUseOf, we’ve rated their products somewhere between six and eight (out of 10). The competition in the tablet market is intense. 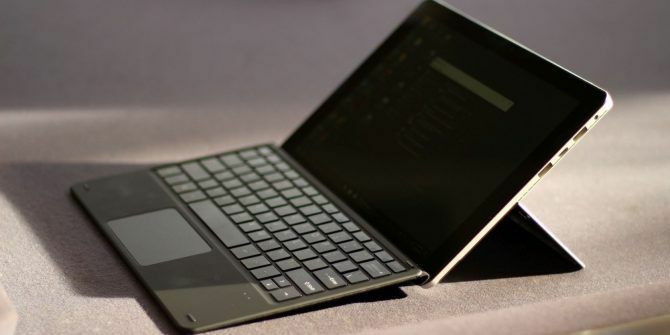 However, for small form factor Windows 2-in-1 devices, there’s only one other direct competitor from a mainstream manufacturer: the Asus Transformer Mini. I’m not sure why, but few companies sell 10-inch hybrid devices. The Asus Transformer Mini offers similar specifications, but with a weaker and older Cherry Trail processor and Windows Hello compatibility Best Windows 10 Ready Hardware & What It Means Best Windows 10 Ready Hardware & What It Means Some of Windows 10's new features require special hardware. We show you what to look out for and which devices best support Cortana, Windows Hello, and Continuum. Do you really need it? Up to you! Read More . However, there are a few competitors from China-based manufacturers, such as the Teclast Tbook series. But most of these — to my knowledge — aren’t comparable to the SurBook Mini, particularly in terms of hardware. If you need a larger 2-in-1 at a similar price point, consider the Acer Switch 3. The Switch 3 offers the same Apollo Lake processor, a larger form factor, all for $450. And, finally, for those looking for simply consuming media — like streaming video — your best bang-for-your-buck is an Android tablet. There are around a million Android tablets out there, so I won’t get into details — but our recommendation is the Amazon Fire HD 10 Amazon Fire HD 10 (2017) Review: The Best Value Tablet Around Amazon Fire HD 10 (2017) Review: The Best Value Tablet Around This year's Amazon Fire HD 10 refresh adds some seriously cool features and drops the price further. We think that makes it the best value Android tablet around – but it won't be for everyone. Read More . It’s impressive, provided you don’t need the Google Play Store out-the-box. SurBook Mini comes with the standard hardware that you’d see on a budget, 10-inch hybrid tablet: a fanless, Atom-based system-on-a-chip (using the Apollo Lake series, with Goldmont CPU cores), a gravity sensor, both front-facing and rear-facing cameras, and a Surface-style kickstand. This particular device includes a keyboard (retail $50). Overall, it’s very similar to the Asus Transformer Mini, except that it’s lighter and includes a more modern processor. Note: the SurBook Mini does not include a fingerprint sensor or an infrared camera for Windows Hello. Intel produces a low-power, low-cost processor which we refer to as Atom processors. These trade speed for low price and energy efficiency. Of particular interest is how Apollo Lake compares to Cherry Trail. Cherry Trail ended Intel’s flirtation with low-cost processors in the $20-40 price range. Since then, Intel has focused on the $100+ market segment. Apollo Lake represents Intel’s return to more expensive devices. The specific system-on-a-chip (what’s an SoC? Jargon Buster: The Guide to Understanding Mobile Processors Jargon Buster: The Guide to Understanding Mobile Processors In this guide, we'll cut through the jargon to explain what you need to know about smartphone processors. Read More ) used in the SurBook Mini is the Intel Celeron N3450. It’s by no means a cheap SoC, like its forebearer, Cherry Trail. The N3450’s MSRP is $107. According to Intel’s spec sheet, the N3450 lacks Hyperthreading, meaning its performance for certain applications and background tasks isn’t great. It’s also an in-order execution style processor, which uses less power than out-of-order processors — but with a performance penalty. Overall, there’s nothing new here that we haven’t seen in the hardware of a dozen other tablets and laptops. Could Atom Processors Be Defective? Cisco Systems announced in November of 2016 that a component on its systems was defective. They did not name the manufacturer of the component, but some analysts speculate, based on compelling evidence, that the component is related to Intel’s Atom SoC and that it will fail after 18-months of operation – approximately 6-months after the warranty has expired. I believe that this hardware fault will not affect more expensive processors, like the Atom N-series. Rather, this more than likely impacts Intel’s $20-40 mobile and embedded processors, such as Cherry Trail. The Chuwi’s screen ranks among the best screens that I’ve seen on a budget 2-in-1. The brightness scales in intensity from eye-burningly bright to fairly low intensity — although I’ve seen devices with better brightness scaling. On a 10.8-inch screen, the 1920 x 1280 pixel resolution screen looks great at all angles. I’m not an expert on screen quality, but overall, it’s a good panel with 450 nits of backlighting for very good outdoor visibility. In the image above, you can see a comparison between the Acer Switch Alpha 12 on the left, with a matte display, and the SurBook Mini on the right. As you can see, the screen is brighter. The SurBook performs about as well as Intel’s Core series for basic computing tasks. For mobile games, like Fallout Shelter, and Asphalt 8, the SurBook runs both games fluidly and seamlessly. There’s no framerate drops, no choppy gameplay, and overall, it feels just a Core series processor. The SurBook’s eMMC drive is the SanDisk DF4064 which is eMMC 5.1, the latest technology. It’s fast, as far as eMMC drives go. Unfortunately, I can’t find its exact hardware specifications for the DF4064, but I believe it’s part of SanDisk’s newest drives. I’m not sure what controller it uses or its NAND type. Compared to older eMMC drives, the DF4064 should be more performant. CrystalDiskMark partially bears this assumption out. The SurBook’s DF4064 drive performs at around 37% faster than older eMMC drives (like the DF4032) for sequentially writing to disk. For random writes, though, it’s actually slower compared to drives we’ve seen on other budget tablets. For example, random writes are generally the best indicator for how snappy a drive feels. Overall, though, it’s clear that Chuwi isn’t using parts off the bottom shelf and its 4k random read and write performance may be an error. Another possibility is that Chuwi has either intentionally or unintentionally disabled the faster performance of the DF4064. Don’t get me wrong, though. For an eMMC drive, the read and write speeds are very good. The SurBook’s battery life is solid for a 10.1-inch 2-in-1. Its 5,000mAh lithium-ion battery gives it enough juice to run for two hours 45 minutes while playing Fallout Shelter. While playing Asphalt 8, the battery lasts for two hours and 30 minutes. When used purely for reading, it gets around six and a half hours — making it among the longest lasting 10.1-inch tablets on today’s market. Although Apollo Lake gets around 25% better performance, it also seems to provide better battery life for most tasks. Used purely as a reading device, the SurBook Mini gets around six and a half hours of battery life. Using the provided Power Delivery charger, the Chuwi goes from discharged to full in about three hours and 45 minutes. Other chargers do a poor job of getting the battery back up to full charge. As noted prior, because of the non-standard USB-C port, you cannot use most third-party USB-C chargers. A regular length USB-C charging cable will end up not fitting and that kills a big advantage of having a USB-C port. For example, if you wanted to output video over its USB-C port, you’d need a special adapter (which I can’t find online). The biggest weakness of the SurBook Mini is its keyboard and touchpad. Like many other 10.1-inch tablets, the accompanying keyboard comes with compromises. First, the keys are slightly undersized. Second, Chuwi chose to rearrange or eliminate some of the keys, such as Print Screen. Overall, though, the keyboard isn’t going to be difficult for touch typists. While compact, it’s not difficult or irritating to use — if you have average sized hands. For those with very large hands, though, you may want to stay away from the SurBook. A slightly irritating feature of the keyboard is that it doesn’t disable itself when folded behind the tablet. While users can simply remove the keyboard when they want to use the SurBook in tablet mode, it’s an unfortunate feature if you often switch between laptop and tablet configurations. There’s also no keyboard backlight. While most users probably don’t care, keyboard backlighting is always a nice — although unnecessary — feature. The Chuwi’s speakers only emit audio out of the left side. Fortunately, they’re not the abominable rear-facing speakers we’ve come to expect from budget tablets. Their audio quality is serviceable, although not particularly amazing. Its telecommunications performance isn’t perfect — but it’s good. Like most budget tablets, it uses a single microphone, meaning it’s not noise canceling. Overall, if you’re looking for a tablet, primarily aimed at chatting, you can find better devices out there. The Chuwi SurBook uses a 1×1 Intel 3165 802.11ac Wi-Fi card which also includes Bluetooth 4.2. It’s not a high-end card — it’s designed to bring Wireless-AC to the budget market. Using the Wi-Fi Analysis app, the SurBook gets around -51 dBm (a measure of Wi-Fi signal strength). However, it’s a 1×1 device, meaning it uses two antennas but it can only transmit and receive one spatial stream from each. At equal distance from the router, the 2×2 802.11ac card inside of my Acer Switch Alpha 12 gets -43 dBm. That’s a substantially better signal strength. While in the budget market, the Intel 3165 series is on most dual-band devices, if you often use a distant access point, you may want to consider a higher end 2-in-1. How Does the Chuwi SurBook Mini Feel? Usability is the Chuwi SurBook’s strength. At just under 800 grams, the SurBook Mini is light enough to use as a reader. It’s not nearly as light as a Samsung Tab S2 or S3. 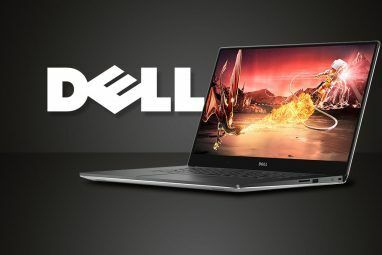 But its compact size and wieldy form factor make for an ideal platform for consuming media, surfing the web, doing research, and writing papers. Judging from the USB-C’s extra long tip, I would guess that the SurBook wouldn’t be easy to disassemble. However, Chuwi published a teardown and, believe it or not, the SurBook Mini is extremely easy to tear down, particularly for a 2-in-1 tablet. This should have the impact of making repair costs cheaper. Unfortunately, that’s offset by the high cost of shipping. Also, the motherboard configuration uses an eMMC drive and soldered on RAM. That means if any part goes bad, the entire motherboard — and its $107 processor — would need to be replaced. While Chuwi warrantees their products for a full year, most warranties for similar electronics tend to require return shipping to China. For a $250 device, that cost is almost prohibitive. Overall, the Chuwi SurBook looks like a strong contender in the ultraportable 10-inch 2-in-1 marketspace. It’s by no means perfect, though. Non-standard USB-C port requires a longer USB-C charging tip. Some design elements suggest a lack of quality control. Weak warranty requiring shipping costs to China. Amazon is charging $100 above what its Gearbest pricing is. Folding the keyboard behind the tablet doesn’t disable the touchpad or keyboard. This leads to accidental mouse and keyboard activations. Should You Buy the Chuwi SurBook Mini? That leaves one big weakness: Chuwi doesn’t operate an official repair center in the United States. That means if you purchase it from Amazon, your warranty may be equal to Amazon’s return period. And if you buy from GearBest, you would need to pay shipping costs to China. Explore more about: Chuwi, Windows Tablet. "Surbook" is a nice product with good features for a common User. This is best surbook I love the design and the performance. I am impressed by the attention to detail on the CPU and HDD specs, comparing to other similar CPU and HDD, more interesting than those short reviews with barely any hardware talk. But this thing has 500mah or 8000 mah battery, which is it? Hi David, I'm about 90% sure it has a 5,000mAh battery. The official specifications that were originally published by Chuwi show it to be 8,000mAh. If that were true, its battery life would be much longer than the numbers I've seen from it. Unless the unit I have has a defective battery (which I doubt). I have a 10.1" dual system tablet which I use solely as an android. It is very well built, relatively light and has always worked flawlessly. That is until the battery ran down in a matter of an hour or so and sometimes struggled to take a charge after about a year of quite heavy use. I'd still recommend it, I now just keep it on charge by my bedside. For $au200 how can one complain! Using a keyboard for a 10"+ machine doesn't make much sense to me so I'd probably choose another model. I bought a Teclast 2 in 1 tablet with windows and android. It is very poorly built and has always glaring flaws. I always run it on Android. The system isn't powerful enough to run Windows. At one point a few months after purchase, the tablet stopped working. Than a few weeks later, it starting working again. Than it stopped working. I had to take it to the shop for repair. Like Idodialog, the battery has run down to the point where its plugged in most of the time. At the time of purchase, the deal included a keyboard. It worked well initially but has degraded over time. When I wake up the tablet after a long period of inactivity, the keyboard sends gibberish input to the tablet. I have to disconnect and reconnect the keyboard and then wait for 3 seconds for the system to refresh. Additionally, given enough time after startup, the speed of the system slows time and eventually freezes, requiring reboot. Fortunately, it remembers all the tabs you had opened. Hopefully Chuwi tablets are of higher quality than Teclast tablets, but I am weary of any and all "gearbest" merchants. Meh, my dad used to have a MS Surface Pro 3 and he had the same problem: after a couple of months it stopped working and a few weeks later it started working again. So I wouldn't blame this on these cheap manufacturers as even something as expensive as the Surface Pro 3 can have that issue. The SP3 (and all Surface products IIRC) has a pretty horrendous reliability record. Consumer Reports pulled their recommendation because of customer complaints. Their 2-year failure rate was something on the order of 25%. Which makes it one of the least reliable manufacturers around. I think some of those failures were probably due to software problems, though.